For a type 2 diabetic an A1C or HBA1C test is your report card. The numbers may be good or it can just mean that there is more work to be done. But if you don’t know what an A1C test is and why it important, the purpose of this article is to make it all crystal clear for you. One big problem with testing your blood sugar any given point in time is that it doesn’t really give you the big picture. You may have low numbers after having very high numbers for a majority of the time. That’s where a more long-term measure is necessary. That’s where the glycosylated hemoglobin or HBA1C (or A1C) test comes in. 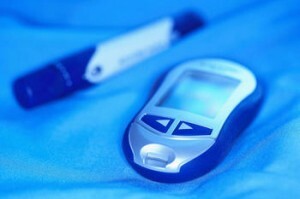 An A1C test looks at how your blood sugar levels have been doing over a 2-3 month period. In order to do this, this test looks at hemoglobin levels. The way it works is red blood cells live for about 120 days in your body. And it is the hemoglobin inside of the red cells (the portion of the red blood cells that carry oxygen) bind to blood sugar to form hemoglobin A1C. When blood sugar is high, A1C levels are also high because there is more glucose in the bloodstream. An A1C test is a good measure of long-term blood sugar control, and not of short-term control. The goal for an A1C test set by the American Diabetes Association (ADA) is <7%. However, the American Association of Clinical Endocrinologists (AACE) has a stricter target, which is <6.5%. And the recommendation for an A1C test is at least twice per year. You can have your doctor do it or you can get an at-home A1C kit and do it yourself. Below is a chart that shows the average blood sugar level of the A1C. The major reason why there is so much of a focus on A1C is because the higher your A1C the higher your risk is of diabetes complications. According to the ADA, for every 1% decrease in A1C, is related to a 37% decrease in microvasuclar complications. Microvascular complications are those that affect your eyes, kidneys and feet. For the most part, most of the physicians that I have worked with all prescribe medications for patients with a high A1C. And if an A1C is off the charts, like say an 11% or above, many doctors will go right to insulin therapy. A great and safe way to lower your A1C naturally is to become more consistent with what you eat, exercise, and testing. And once you find those foods and exercises that work well for you, sticking with them and making them your go-to foods/exercises. Consistency is the key. And this is why an A1C test is so powerful. It lets you know your consistent blood sugar levels over a longer time period. Prior to using any of this advice or material, please consult with your physician. I have 120 fasting sugar and 230 Post Diet . What should I do to check the sugar. I am a patient of Acitabulum with femur bone dislocation for more than 12 years. I get pain while walking.I therefore request you to suggest what other exercises I must do to control blood sugar . Frequency of urine is more during night time and frequent in take of water is needed . No sexual instinct or vigour . I am a Male with difficulty in erection. My age is 59 now. I’d recommend swimming or resistance training (weight training – my favorite!). But if your mobility is limited, maybe even try chair aerobics. I think exercise will help improve your vitality and vigor. Also, better blood sugar control after meals will help you as well. Your post meal blood sugar is the problem (230). So you need to tweak your diet. It’s tough to tell you what to tweak with no idea of what you’re eating. But the closer you can keep your sugar to normal ranges the better the rest of your machinery will work.